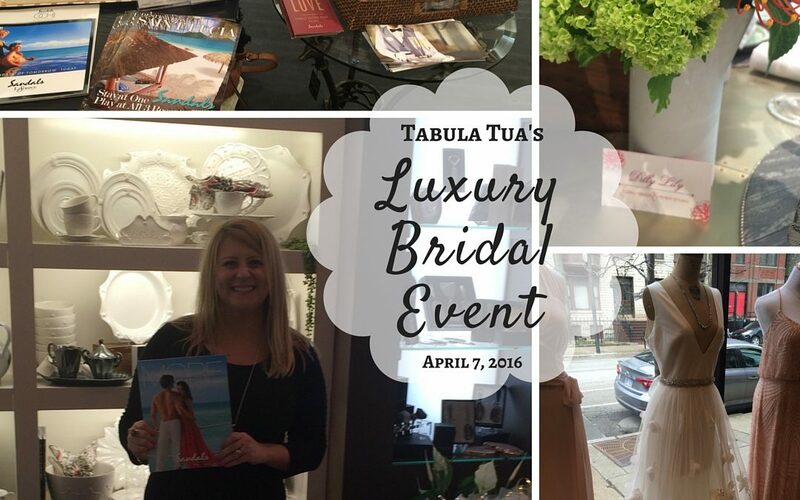 Tabula Tua’s Luxury Bridal Event was a great success. My fellow wedding professionals and I had a great time talking weddings and how we can all work together. The brides and grooms that attended learned so much about these great small businesses that focus on every detail and outstanding customer service. I was so impressed with the talent in the room. Lucky Invitations shared so many of their amazing invitations and custom stationary throughout the space. All of there work is handmade on their personal letterpress. I can’t stress enough the quality and beauty of all their work. Don’t you love how they printed the menu on the napkin. Nice job, Lucky Invitations. I can’t get enough! The flowers were gorgeous. Dilly Lilly really made the event special with the floral touches throughout the space. I love the combination of colors they used. You know how much I LOVE Sandals. More Luxury Inclusions that any other all-inclusive resort brand! I also met the girls from BrideSide and I adore them. They are an online bridesmaid boutique. Genius for wedding parties that are not all in the same location. You can order a dress and I have it where you could your decision. We even talked about having a “fit” party. Picture you & your girls, sipping on bubbly and having fun with the dresses all hosted in your own place! That beaded pink dress on the right is under $300 and is absolutely gorgeous. With all the beading work I thought I was going to have sticker shock. Great job ladies! Bittersweet had an incredible spread of sweets that everyone enjoyed. Both beautiful and delicious. I am very smitten with Bittersweet. Definitely cater from them for your next wedding event. Meet All The Wedding Experts from this amazing event! Thanks so much to Tabula Tua for the great hospitality. It was a memorable and fun event. I look forward to working with all of you very soon again!